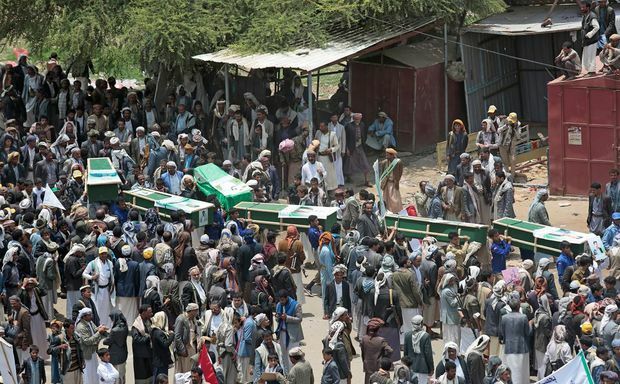 In this Aug. 13, 2018 file photo, Yemeni people carry the coffins of victims of a Saudi-led airstrike, during a funeral in Saada, Yemen. The United Nations’ refugee agency said Friday there were nearly 1,500 civilian casualties in Yemen from August through October, the latest grim tally to emerge from a four-year civil war as opposing parties hold talks in Sweden. The announcement came as Yemen’s Iran-backed Houthi rebels and the internationally recognized government, supported by a Saudi-led coalition, met for a second day for UN-sponsored talks aimed at halting the bloodshed. UNHCR urged the two sides to do more to protect civilians, saying data from Yemen show an average of 123 civilians killed and wounded every week during the three-month period, in a war that has killed at least 16,000 civilians. The Houthi delegation later said that talks had been divided into five main sections, including opening up Sanaa airport for aid, adding that the prisoner swap would include all detainees from both sides. “The first section is the political framework, the second section is the airport … then Sanaa and the economic measures and humanitarian issues, and the fifth – and it has been discussed and finished – is concerning the detainees and prisoners of war,” senior Houthi negotiator Abdul-Malik al-Ajri said. In a release from Sanaa later Friday, the rebels said their delegation had met with Mr. Griffiths and looked forward to having success in the talks and making concrete progress. “The international envoy discusses the importance of such consultations and affirmed that progress must be made on three important issues: the general framework, political solution and calm, and confidence-building measures,” they said. Yemen’s conflict, which has pushed the country to the brink of famine, pits the internationally recognized government against Shia rebels known as Houthis, who took the capital of Sanaa in 2014. The Saudis intervened the following year. UN officials have sought to play down expectations from the talks, saying they don’t foresee rapid progress toward a political settlement but hope for at least minor steps that would help to address Yemen’s worsening humanitarian crisis and prepare a framework for further negotiations. UNHCR says of the 1,478 civilian casualties, 33 per cent were women and children. That’s a total of 217 women and children killed and 268 wounded. An Associated Press investigation published Friday has revealed evidence of torture at detention sites run by Yemen’s Houthi rebels. There has also been international outrage against the coalition over abuses. The Associated Press has exposed torture at secret prisons run by the UAE and their Yemeni allies and has documented the deaths of civilians from strikes by drones in the United States’ campaign against al-Qaeda’s branch in Yemen.